I am always looking for ways to use up food, and avoid waste. One thing that has always bugged me was the giant bag of sauces and condiments that our local Chinese place always threw into delivery orders. 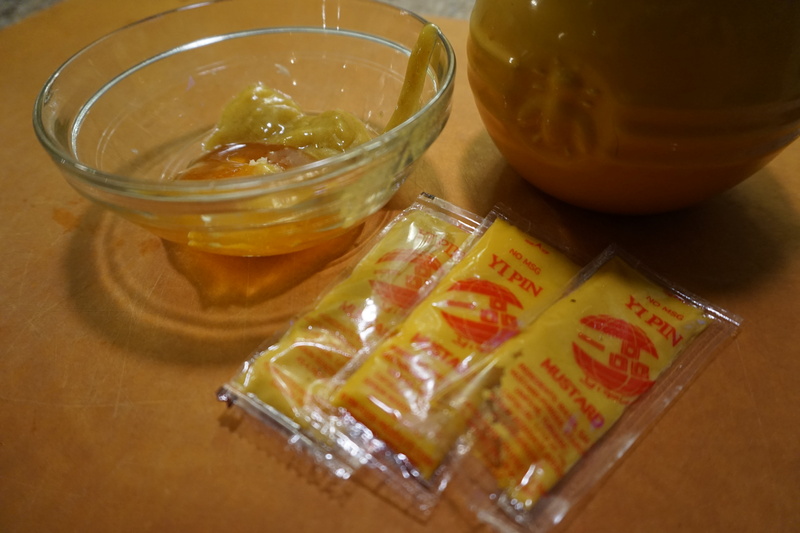 Soy sauce for an army, crunchy wontons for the soup, duck sauce and mustard packets galore. I would save the packets thinking I would use them but then when I needed soy sauce I would just use the mega bottle I already had in my pantry and the packets would annoyingly fall out of the fridge door once too many had accumulated. Necessity is the mother of invention – the vibrant yellow hot mustard seemed like the natural choice to try to get more usage out of these packets and that is how this delicious and healthy side was born. By mixing the very piquant mustard with garlic and honey you smooth out the flavor but still get that nose tingling bite. I love napa cabbage, which is much softer and less bitter than regular green cabbage. Roasting it caramelizes the leaves and gives you a little bit of crispness. This is also delicious served cold the next day, with the cabbage chopped up and mixed with the sauce or it would make a nice vegetarian dish served over brown rice. So next time you decide to call for Chinese takeout make sure to save a couple of those dreaded packets and give this dish a whirl. Preheat your oven to 500 degrees. Cut the napa cabbage in half lengthwise. Drizzle both sides with olive oil and place cut side down on a cookie sheet. 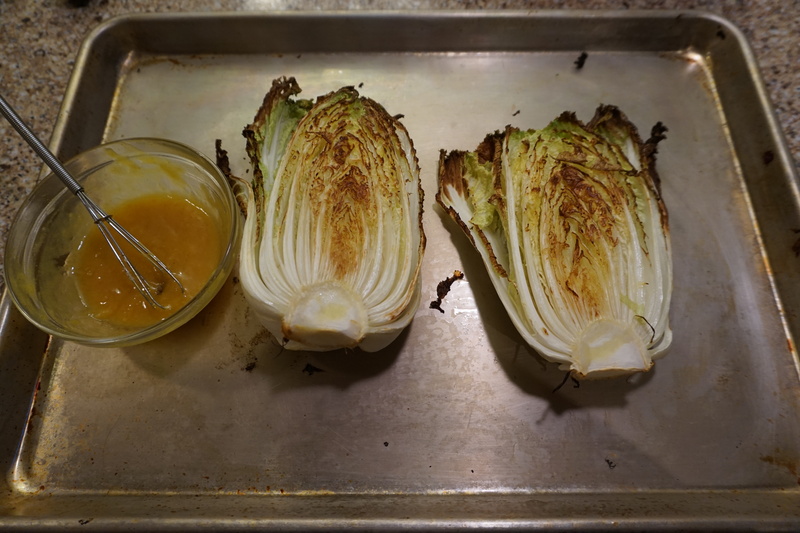 Roast for 7 minutes – while the napa cabbage is roasting in a small bowl combine the garlic, honey and Chinese hot mustard. Use tongs (carefully!) to flip the cabbage and roast for 7 minutes more. Transfer the cabbage to a plate and drizzle the sauce over.